How to cook shellfish on the BBQ. If you’ve never cooked shellfish on the BBQ — lobster, crab, clams, oysters, prawns, scallops, mussels — you’ll be amazed at how fast and easy it is. Give it a try with these simple steps using Kingsford® Charcoal. Shucking oysters is not difficult to learn. Be sure to hold the oyster in a towel or wear a glove to protect your hand. You can also place the oyster on a cutting board for stability. Hold the oyster cupped side down, flat side up for shucking. Using a sturdy oyster-shucking knife, place the tip of the knife in the thicker, tapered end of the oyster, near the hinge. Rock the knife back and forth to insert it, then twist the knife to pop the oyster open. Next, insert the knife fully to carefully scrape the muscle from the upper shell, then lift the shell off. Similarly, use the knife to cut the muscle from the lower shell. Be careful not to spill the juice from the cupped shell below – it’s delicious and helps cook the oyster when barbecuing. For barbecuing hard-shelled mollusks, you want to set up a hot [single-zone fire]. 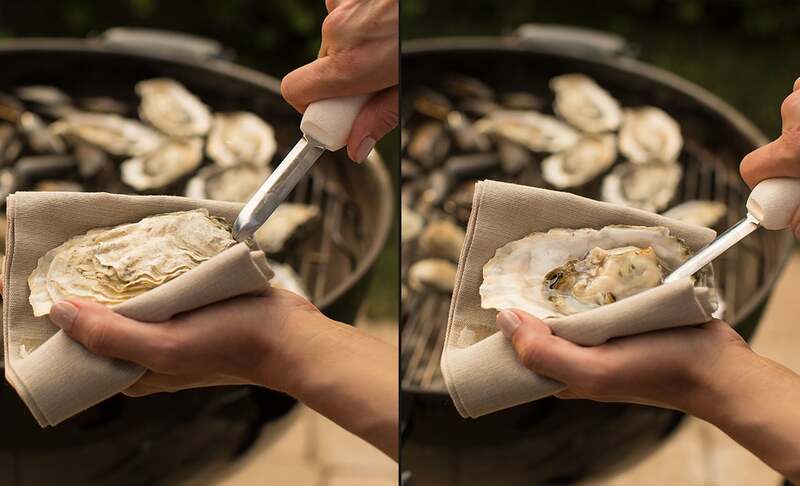 Place the clams, mussels, or shucked oysters directly on the BBQ and close the lid to retain heat. There’s no need to turn them. When the clam and mussel shells pop open and the meat is juicy and plump, they’re done. Oysters are done when they are opaque and cooked through, but not dried out. Remove shellfish from the BBQ and serve immediately. Discard any shellfish that doesn’t pop open. Generally speaking, discard oysters and mussels that don’t open after 5 minutes, clams that don’t open after 10 minutes. That’s a long time, and the bad ones will stand out easily versus all the rest that have already opened. Rinse the deveined shrimp or scallops in cold water, pat dry with a paper towel and season to your liking. Though not necessary, the easiest way to barbecue shrimp and scallops is to skewer them on metal skewers or bamboo skewers that have been soaked in water (skewer them lengthwise so they lie flat on the grate). Another option is to place them inside a nonstick or oiled barbecuing basket. Never cram shellfish tightly on a skewer; make sure there’s enough room for air to circulate between each piece. 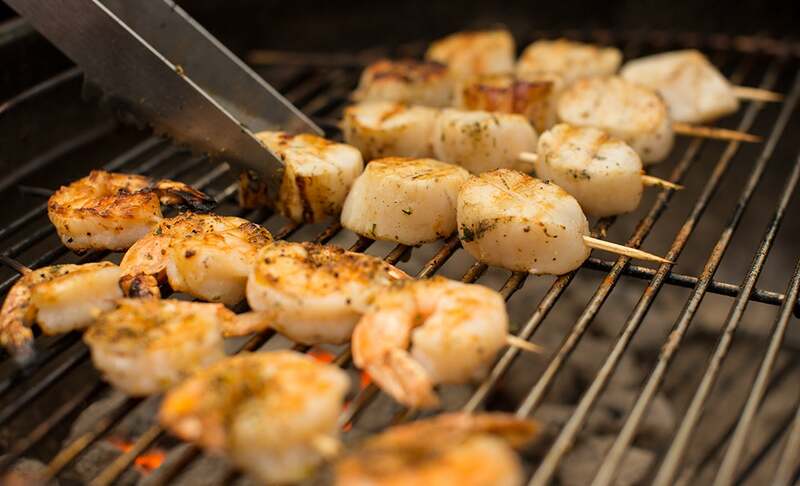 For barbecuing shrimp and scallops, you want to set up a [two-zone fire]. Clean, preheat, and oil your BBQ grates before cooking. Barbecue shrimp for two to three minutes per side, turning halfway through cooking, until the shrimp curls and turns pink. Barbecue scallops on one side for two to three minutes, then flip them and BBQ for about 30 seconds or until the meat is opaque and well caramelized. Although they cook quickly, if the shrimp or scallops begin to burn, move them to the cool side of the BBQ. For barbecuing lobster or crab in the shell you want to set up a medium-hot [two-zone] fire. Rinse the lobster or crab in cold water, pat dry with a paper towel, then brush it with oil. When the BBQ has reached a temperature of about 116° to 121°C, place the lobster or crab bottom side down on the warm side of the cooking grate (not directly over the coals). Barbecue with the lid on until the shell is bright red and you can see juices seeping from the shell, about eight to ten minutes for a 1½-pound lobster or crab. You don’t need to turn it. Remove it from the BBQ, allow it to cool down for a few minutes, then serve. It’s best to leave the shell on when barbecuing shellfish. It protects the meat from getting burned and keeps it moist while cooking. If you want the lobster tail to lay flat while barbecuing, insert a skewer through the tail from end to end. 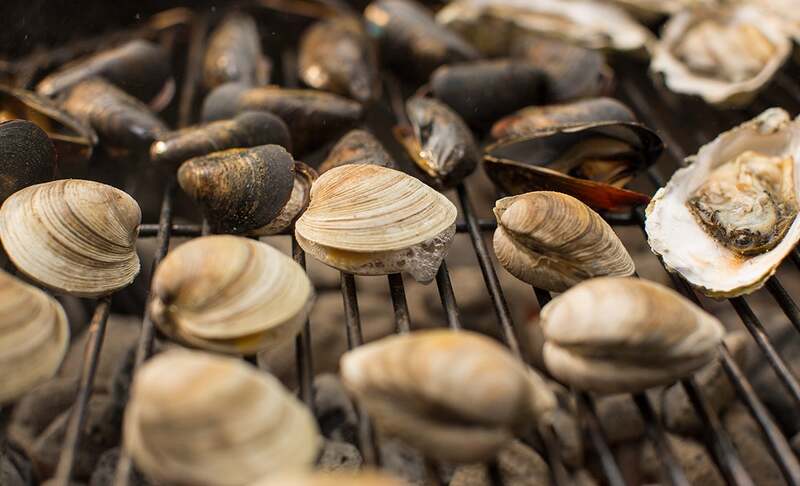 To purge the sand that’s often trapped in clams, soak them in salted water with a half-cup of cornmeal added for one hour, then drain, scrub with cold water and place on the grill.